This Page is dedicated to Ham Contesting. This is very active pat of Ham Radio today. There are many contests, using all modes and most frequency Bands, throughout the year. I added a calendar to this Page with some of the upcoming contests. I decided to buy a second Rig instead of a Second Receiver. Although I wanted to have two rigs on my desk, I did not want to have a second set of all the peripherals – key, microphone, headphones, etc. When I discovered the Top Ten DX Doubler, I saw that as a perfect central Controller for my station. It allows me to use the two radios with one set of peripherals, and provides switches for selecting which rig to use. I quickly got comfortable using the DX Doubler (DXD) to control my station, using the “manual” mode switches on the front panel to switch the active Transmit/Receive radio between the two rigs. I had been starting to increase my interest in Contesting and started looking at how to better utilize my 2-rig station. 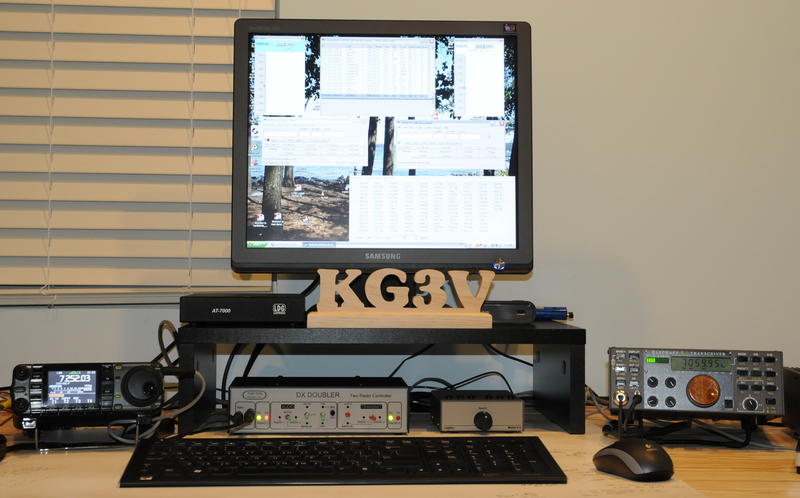 The DXD was designed to control for an SO2R contesting station, where the operator is using both rigs in a contest, to allow a higher rate of stations-worked, as you can be on two Bands almost simultaneously. If you really get good at SO2R, you really are on 2 Bands simultaneously. I began building a basic SO2R station. There are several good software packages available for SO2R contesting operation. I selected N1MM and more recently N1MM+, the new version of this software. N1MM+ was written with all the necessary features to support high-efficiency operating in SO2R Mode. I quickly found that there is a significant learning curve to SO2R, but it has been fun trying to get the hang of it. About three years ago I purchased an ICOM IC-7600 for use as the main rig in the station. The K2 would be my second radio and the IC-7000 finally moved to my F-150 pickup truck, where it has been an enjoyable rig for mobile use. About a year ago I purchased an FTDX-3000 to be the new “second”radio at the station. I really like this rig and I think I am done buying radios for a while. So here is a shot of the current station I have for SO2R use, including an additional video monitor. In recent months I have worked a couple of contests with each radio alone, and now have again started trying to get a handle on SO2R. There is no question in my mind that SO2R is an initial setback but a long-term benefit to the contest operator. So I plan to stick with it. As I upgraded computers I realized there is one limiting factor on the DX Doubler for my station. It requires a legacy parallel port (LPT) that was traditionally used with printers. These ports are becoming rare, and practically nonexistent on laptops. There is one Commercial solution that can be used to convert a USB port for use with the DXD but that is expensive and appears to be a generalized solution. I wanted a USB-only solution that was more directed at the DXD box and N1MM+ software. I began development of the “DXDUSB” which is an Arduino-based interface. The DXDUSB employs a USB-to-Serial converter to talk to the computer. there is a well-defined protocol called Open 2 Radio Switching Protocol (OTRSP), that was created just for this application. The OTRSP creator, K1XM, was generous enough to put this protocol in the public domain and the wise developers at N1MM+ have built-in support for OTRSP. The DXDUSB software utilizes OTRSP on the USB Port side and connects to the LPT connector on the DXD box. Intercepting the OTRSP commands with the Arduino provides great flexibility to me as a programmer. Two DXDUSB prototype generations have now been built and tested. Throughout the design process, the folks at Top Ten have been kind enough to provide some information and feedback. The initial design is now underway for a custom circuit board for the DXD. with any luck, this will be available to others in the next several months. The DXDUSB uses a USB-to-Serial interface with the FTDI chipset. This is known to work with N1MM+ software. The converter plugs in to a USB Port on the PC and into the DXDUSB chassis with a standard RJ-45 Ethernet connector. N1MM+ is configured to use the OTRSP protocol to communicate with the DXDUSB. CW Keying and PTT signals are also provided. An Arduino micro computer board converts the signals from the USB–>Serial converter into signals that are compatible with the 25-pin LPT connector on the rear panel of the DX Doubler box. There is no special software or software driver needed. The only driver used is the standard FTDI driver. So installation and setup is simple.